All clients on expeditions going to high altitude (over 4000m) should be aware that it is potentially hazardous. Serious illnesses and even fatalities occur every year in the Andes. Patience with the process of acclimatisation on trekking and mountaineering expeditions is fundamentally important in reducing the likelihood of severe illness. At altitude it is extremely important not to hide the fact that you are feeling unwell or are being pushed too fast. Other expedition members have a responsibility to be patient with anyone feeling unwell or tired at altitude. Altitude sickness commonly starts with a headache; by itself this is not too serious, but it should be seen as a warning that a person is poorly acclimatised. More severe symptoms include nausea (particularly on movement) and a more persistent headache that does not respond to painkillers. This level of illness is known as Acute Mountain Sickness (AMS). With these symptoms people should not climb higher and may need to think about going back down to lower altitudes if they don't start to improve soon. There are two very serious conditions which can develop if initial AMS is not recognised or treated. These are High Altitude Pulmonary Oedema and High Altitude Cerebral Oedema (HAPE and HACE). Both illnesses arise from an imbalance in body fluids caused by the lack of air pressure. In HAPE fluid collects in the lungs, in HACE fluid collects in the skull. They are both likely to be fatal if not treated. The most effective treatment is always a rapid descent to a lower altitude. 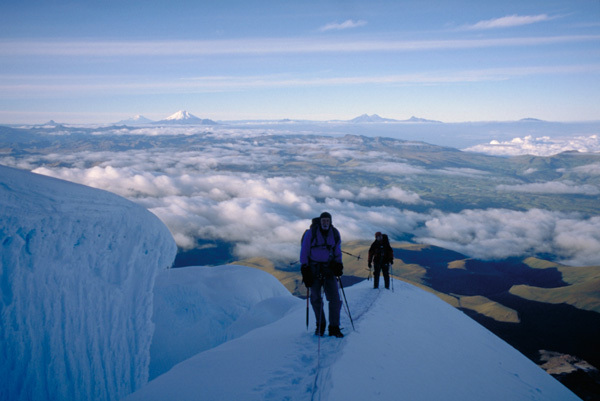 Safety at altitude is largely a matter of good acclimatisation, going slowly and avoiding any over-exertion. Drink plenty of fluids and relax. Get fit before you go to altitude so that you can cope more easily with the demands of exercise at high altitude. Your body will have enough to deal with due to the lack of oxygen without also having to cope with a lack of basic fitness for walking and climbing. Take it easy when you get high. Walk at a slow and steady pace and do not allow others to rush you. Your Performance - There is an enormous difference in how well different people do at altitude, and most of this seems to be genetic, so there is not much you can do about it!. Some perfectly fit people will just never do well at altitude. Others with no claim to being particularly fit do very well every time they go to altitude. The important thing is not to push yourself too hard - once at altitude take it easy, keep your breathing under control, and don't try to keep up with other people if you are not comfortable. Fitness - Get fit before you go. Whilst being fit is no guarantee that you will do well at altitude, if you are unfit you will certainly struggle (you would at sea level anyway!). The fitter you are the better you will do.... but fitness is not insurance against altitude illness. Water - Drink as much as you can. Sipping cold water is probably not the best way to achieve this. Since all fluids are good we would advise drinking as much hot sweet tea as you can (or any other hot drink that you prefer). Pills & Drugs -- What you consume can have some effect on your acclimatisation. In particular avoid depressants such as alcohol and sleeping pills. Stimulants such as caffeine and coca tea can help with acclimatisation. Most importantly drink plenty of fluid - in case you haven't noticed this advice already - this is the third time we've said this...! Caffeine - Caffeine is a drug that is known to help boost performance in endurance events, so within reason there is no reason to avoid it at high altitude. You may hear that caffeine is a diuretic but that doesn't mean that a litre of tea will de-hydrate you - water is also classed as a diuretic. While a strong espresso coffee might be a problem for hydration, you will take on board about 90% of the fluid that you drink in a litre of tea. So for most people drinking hot, sweet tea is more effective for rehyration than sipping small amounts of cold water. Diamox - We are generally against using Diamox (Acetazolamide) at altitude. People who have seen a lot of Diamox use, such as the base camp doctors on Aconcagua, don't think it is a good idea to use any prescription drug. There are several reason for this; because it is a powerful diuretic Diamox can lead to problems with hydration if you are not careful to drink plenty of fluids. This can lead to increased risk of de-hydration and (possibly) an increased risk of frostbite. ANDES expeditions are designed with an acclimatisation program that will suit the majority of people including about 90-95% of our clients. However 10-20% may experience some mild symptoms such as headache and loss of appetite in the early stages. For about 5% of the population who adapt least well to high altitude our acclimatisation programs will be too fast for comfort (indeed any guided trip to high altitude will almost certainly be too fast). This is because the most significant factor in your speed of acclimatisation and susceptibility to altitude illness is genetic. Unfortunately if you have not been to high altitude (5000m+) before you will not know in advance whether you are (genetically) a good or bad acclimatiser. 1. "Fitness is not important. It doesn't matter how fit you are you can still get altitude illness"
While the second sentence is true, we believe that fitness is still extremely important for a successful high-altitude expedition. The key to avoiding altitude illness is not to push yourself hard and over-exercise. Being as fit as possible will only help you acheive this. Get fit first, then take it easy when you are at altitude. It is important to stress that we have often seen altitude illness in otherwise fit people who are pre-disposed genetically to altitude illness. This is particularly a problem on a first visit to altitude, when people do not know what to expect in terms of effort, shortness of breath, headaches etc. We would advise everyone to go very cautiously on their first trip to altitude..
2. "Climb High, Sleep Low"
... is another often used phrase that is not entirely correct. While it is certainly not a good idea to sleep any higher than necessary, you do need to sleep higher to acclimatise to higher altitudes. It is very hard (and potentially dangerous) to climb a 6000m peak if you haven't slept above 4000m for at least a few nights. Think of your acclimatisation level as a mix, or average, of the altitudes you have climbed, walked and slept at over the last week or two. So someone who sleeps 3 nights at 3000m then 3 nights at 4000m but does no exercise will probably be better acclimatised than someone who sleeps every night at 1000m, but walks every day for 5 or 6 hours at 3000-4000m.